Spray two loaf pans with Baker's Joy or similar. In a small bowl add add the 2 Tablespoons of white sugar and 1/2 teaspoon of ground cinnamon. Dust the two loaf pans with the cinnamon mixture. In a large bowl, cream softened butter with sugar with mixer. It will be coarse not creamy. Mix in eggs, mashed bananas, sour cream vanilla and cinnamon. Mix ingredients in bowl with mixer. Add salt, baking soda and flour. Hand stir till blended. Do not use mixer or it will change from a heavy bread to more of a cake like consistency. Divide mixture by pouring half into each loaf pan or about 3/4 full. Keep in mind it will rise as it bakes. Sometimes I have a little left over depending on the size of the bananas that I use. Sprinkle any remaining cinnamon sugar on top. Bake for 1 hour to 1 hour and 10 minutes. Larger loaf pan took 1 hour and 30 minutes for two pans. Test doneness with toothpick. Let cool 5 minutes and gently invert pan. Loaf with fall right out if it has been prepared as mentioned. Slice and serve warm. Also freezes well. Don't want to wait an hour to bake? Bake muffins in 20 minutes! They were just as moist and delicious. Yields 22-24 muffins using the half recipe below. I used only 2 bananas which made 22 muffins. Spray muffin tins without liner. Dust the tin with the cinnamon sugar. If you have extra save for after filling the muffin cups and sprinkle on top. Fill about 2/3 high for each muffin. Bake for 18-20 minutes. Test for doneness with toothpick or skewer. Muffins pop right out of tin after baking! Mix with mixer until you add flour. Then use a spoon to mix. Consistency of bread with be like cake if you use a mixer. My bread pans are a little larger 4.5" x 8.5", so it took 1 hour and 30 minutes! I noticed a great variety of sizes on Amazon so you just have to know your oven and check early to see if it needs more time. 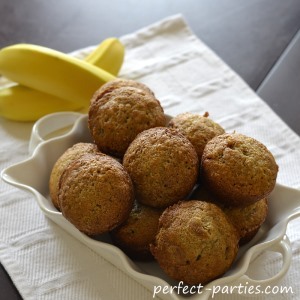 Banana Bread can be made ahead of time for parties or for breakfast brunch events. Warm up slightly or serve room temperature. It also freezes well. Do NOT use fat free sour cream. The muffins turn out crumbly and not moist at all.